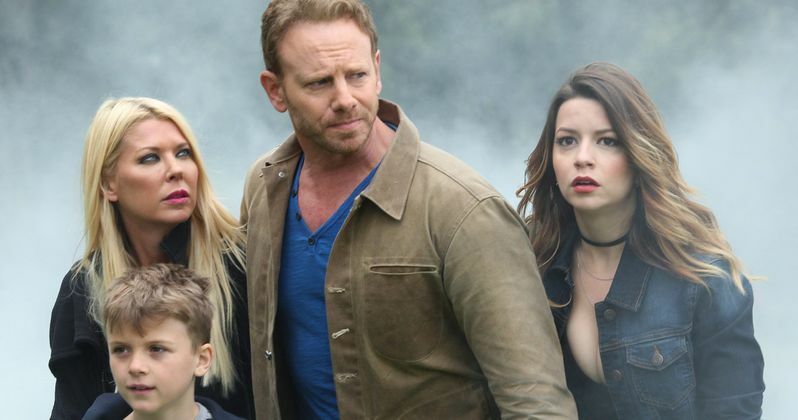 Syfy and The Asylum announced today that Ian Ziering and Tara Reid will again star in Sharknado 5 (working title), reprising their roles as shark-fighting heroes Fin Shepard and April Wexler. Principal photography commenced today, February 2, in Bulgaria. The latest film in the hit global franchise, Sharknado 5 features the return of original cast member Cassie Scerbo as Nova, a bartender turned badass Sharknado fighter. Sharknado 5, which sees the deadly weather phenomenon of shark-infested storms bombard cities around the world, will film in more than 5 countries, including the UK and Australia. Anthony C. Ferrante, who directed the first four films, is back to helm this latest installment, based on a script by Scotty Mullen. Syfy also released a brief excerpt from the screenplay, which shows that the Sharknado has surfaced in London near the Buckingham Palace gates. What's interesting is last year, Thunder Levin, who wrote the first four Sharknado movies, revealed in an interview that he developed a story arc for the next three movies, Sharknado 5, Sharknado 6 and Sharknado 7, which he submitted to The Asylum. Sharknado 5 will be the first Sharknado movie Thunder Levin hasn't written, with Scotty Mullen, who wrote last year's Zoombies and served as casting director on Sharknado: The 4th Awakens, taking over the writing duties. The original 2013 Sharknado film, which introduced a cyclone depositing man-eating sharks on the citizens of Los Angeles, became a worldwide phenomenon and spawned a pop culture franchise. In Sharknado 2: The Second One, New York City was the target of the disaster, and in Sharknado 3: Oh Hell No!, a mega-sharknado made its way down the "Feast Coast" from Washington, D.C. to Florida. In the most recent installment, Sharknado: The 4th Awakens, the shark-infested storms went national. The film ended with the Eiffel Tower ripping away from Paris and crashing down on Niagara Falls, a chilling indication that no one in the world is safe! Now, in Sharknado 5, with much of North America lying in ruins, the rest of the world braces for the inevitable, a global sharknado. Fin Shepard and his family must put a stop to this disaster before Earth is completely obliterated. Sharknado: The 4th Awakens took place five years after Sharknado 3: Oh Hell No!, but it hasn't been confirmed if there will be another big leap forward in time. Syfy hasn't announced when Sharknado 5 will debut, but the first four movies have all debuted on the cable channel during the month of July, so it seems likely Sharknado 5 will follow suit. Syfy is a media destination for imagination-based entertainment. With year round acclaimed original series, events, blockbuster movies, classic science fiction and fantasy programming, a dynamic Web site (Syfy.com), and a portfolio of adjacent business (Syfy Ventures), Syfy is a passport to limitless possibilities. Originally launched in 1992 as SCI FI Channel, and currently in 96 million homes, Syfy is a network owned by NBCUniversal, one of the world's leading media and entertainment companies. NBCUniversal is a subsidiary of Comcast Corporation. The Asylum is one of the world's leading brand-oriented motion picture and television studios. With a focus on high-concept, market-driven entertainment, like the Sharknado franchise and the popular Z Nation television series, The Asylum finances, produces and releases 25 films per year through its direct pipeline to the nation's top retailers and its network of international partners. Since its founding in 1997, The Asylum has released more than 500 films and has built a library of over 200 original productions, including top-rated movie premieres for Syfy, Lifetime, and Animal Planet networks. In addition, The Asylum has begun production on Season 4 of Syfy's highest-rated scripted show, Z Nation, a critically-acclaimed action-horror series. Hopefully we'll find out more casting details, including the latest crop of cameo appearances, as Sharknado 5 continues production. In the meantime, take a look at this excerpt from the script below.